But the real reason for using Skritter is the algorithm behind the software, which allows you to remember more than the 90% of the characters that you are studying (in the photo below you can see that in 30 days I was able to remember the 92.9% of the characters that I studied, it’s the green number on the bottom-right corner). 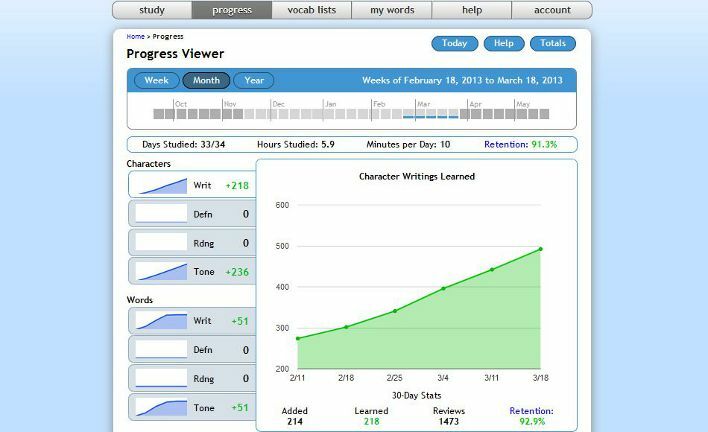 Skritter is a Spaced Repetition Software (SRS). I’ve explained what a SRS is here. In a nutshell, when you review the characters by yourself you are often forced to review all of them without a precise scheduling. Conversely, Skritter keeps track of your mistakes and shows you more often the characters that you still don’t know how to write. When you are dealing with fifty or one hundred characters this may seem a small advantage. But when the characters sum up it translates in a huge gain of time. Skritter costs 14.99 USD per month. You get a week of free trial, you pay month by month so you can unsubscribe when you want, 100% money back guarantee and, if after a while you decide to don’t pay anymore for your subscription, you can still keep using the software for free to review the characters that you have already learned. Also, you can sign up to the free trial from one of the links on this page and use the coupon “FURIO3952”. In this way if later you decide to buy you’ll get a 33% discount for the first six months. If you have an iPhone, an iPad or a smartphone Android, then you can use the Skritter’s app and write the characters through the touchscreen. If you don’t have an smartphone or tablet, you can still use Skritter on your laptop. You have three choices: use your mouse, use the touchpad on your laptop, or invest in a pen tablet. The obvious advantage is that you learn how to write. But, in my opinion, there is a more important point. Many Chinese characters are very similar. As an example, take the characters 青， 请， 清, 情 and 晴. They all have a similar pronunciation (qing, but with a different tone). However their meaning is different (they means “green,” “to ask,” “pure,” “feeling” and “clear weather,” respectively). When you only learn how to recognize the characters but you aren’t able to reproduce them from scratch (that is you don’t know how to write them), it’s easy to get confused. Especially when the characters are used to compose more complicated words. Also, when you start to write characters regularly and learn the radicals, something amazing start to happens. Let’s take the example from before, that is the word 游泳. But once I’ve learned how to write the basic components of the word 游泳, writing it became easier and now there is no way that I confuse it with 旅游. Learn by rote: keep writing a character till it sticks on your mind it’s tempting. However, when you don’t know how to write a specific character, it’s much more effective to stop and analyze the character for a bit. Which are the radicals that compose it? Can you find some hints (that is a mnemonics) to remember it? Don’t have a specific goal: You should have a clear and measurable goal instead of learning random characters with a random scheduling. My goal was to learn the radicals and the characters of the first four levels of the HSK test (about 1,300 characters in total). Burn out: Skritter is addictive. And at the beginning it may be tempting to keep using it longer than you planned. But keep in mind that you will have to review the characters you are learning (or you will forget them) according to the scheduling computed by Skritter’s algorithm. If you learn too many characters too fast you will soon be overwhelmed by the number of characters to review each day. Thus, at some point you will have to choose between studying longer or giving up. Remember to keep a pace you can sustain in the long term! Study the wrong characters: If you have never written a Chinese character before you can’t start with characters that are too complicated. It will take you a crazy amount of time to learn each of them and you will probably lose your motivation. Try to begin with an easy deck, for instance the radicals or the HSK one. Remember that complicated Chinese characters are usually a combination of simpler characters. An example? 意=立+日+心. Start from the basis and build from it! Skritter offers a lot of features. Here you have the complete list. I especially like the lists of pre-made flashcards (I chose the HSK but there are 1000+ lists available), the stats so that I can keep track of what I’m doing, the possibility to add a mnemonics for a word that I can’t remember otherwise, and the audio reinforcement that allows me to review the pronunciation and tones on the way.